World Superbike champion Jonathan Rea topped the times on Friday in free practice after making steady progress on his Kawasaki throughout the day. Jonathan Rea forged his way to the top in FP3 in Thailand on Friday but the Kawasaki rider says he still needs ‘something more’ ahead of Saturday’s opening World Superbike race in Buriram. 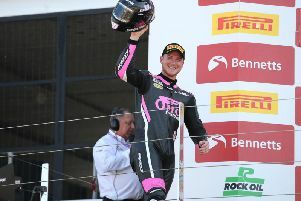 The reigning champion is back to full fitness after overcoming illness and a finger injury, which affected him in the first round at Phillip Island in Australia in February. Milwaukee Aprilia rider Eugene Laverty was ninth fastest in FP3 after leading the way in FP2. Laverty was able to continue following a crash in FP3 following a collision with Xavi Fores. Rea, who was 11th fastest in FP1 before improving to fourth in the second free practice sessions – headed by fellow Northern Ireland Eugene Laverty – claimed the top spot by only 0.057s from team-mate Tom Sykes as half-a-second covered the top ten at the Chang International Circuit. “It feels good and the times are so close. Today I just worked through some set-up changes, arriving step-by-step at a good pace,” said Rea. “In the last session today, which was held at the same time of day as the races will be, we decided to do a race simulation. I was very constant, not really fast, but constant to the end. We need to find a little bit more I think, for tomorrow. “I tried to ride the bike like I did last year but with the final gearing, gearbox and rpm for this season, it is a very different bike,” he added. Laverty was ninth quickest on the Milwaukee Aprilia but his progress was hampered following a collision with FP1 pacesetter Xavi Fores, with both riders crashing out before remounting their machines. Spain’s Jordi Torres (MV Agusta Reparto Corse) was third fastest ahead of Aruba.it Ducati rider and championship leader, Marco Melandri, whose team-mate Chaz Davies was fifth. Andrew Irwin, who was ruled out of the first round in Australia after sustaining a hand injury in a crash, was 25th fastest in the World Supersport class in FP2 on the CIA Landlord Insurance Honda. Jack Kennedy, who is filling in for the injured Stefan Hill on the Profile Triumph, was 16th quickest.